Last fall students from the Legion of Black Collegians were called racial slurs on MU’s campus while rehearsing a performance for their Homecoming celebration. Almost a year later, the LBC remembers its history while looking to the future. On Tuesday, October 18th, the LBC performed a play to tell its history, from the segregationist '30s to the creation of the LBC’s separate Homecoming celebration in 1988 in response to the Mizzou Alumni Association Homecoming theme, “Show me Ol’ Mizzou”. The main character of the play was a young student who was unsure about participating in LBC’s Homecoming. The role was played by Samrawit Areki, a freshman from Chicago. She said she discovered new things about the history of MU during rehearsals. “I have never heard about Lucile Bluford before the play,” Areki said. Lucile Bluford was an African-American journalist who petitioned to enroll in the Graduate School for journalism in the 1940’s. Areki said she felt it was important to perform in the play because of the events of last fall. “The history of Mizzou, everything that happened last year and having the only black student government in the nation drew me to this university,” Areki said. But the LBC made the decision not to dwell on the events of last fall, but rather talk about the African-American history on campus in a larger context. “The events that happened specifically with LBC being called racial slurs last year and then again this year, that’s kind of negative,” the president of the LBC, Shelby Anderson, said. “We want to harp on on positive things. And that’s not to forget! Everyday outside this, we are doing work that has to fix what happened; but for this moment we just want to have a chance celebrating who are,” Anderson explained. 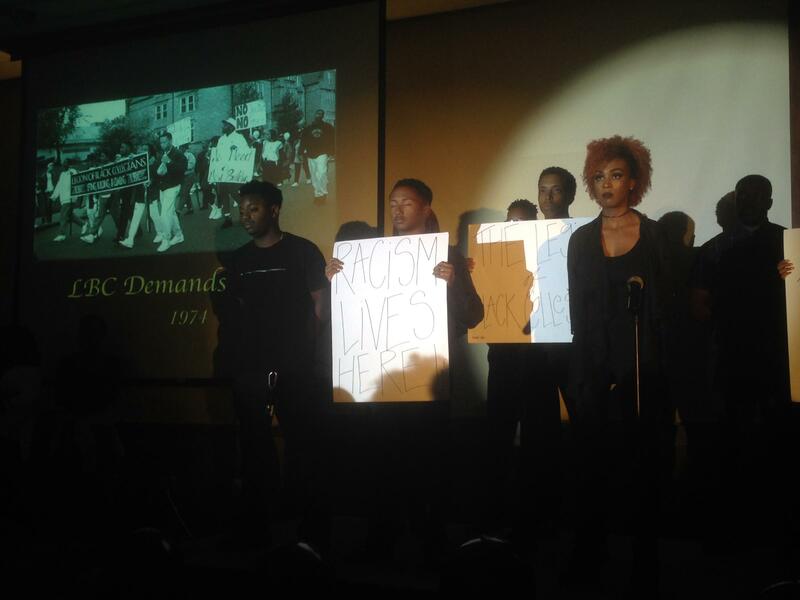 The play called “LEGIONcy”, highlighted important characters who changed the perception of black people on campus. Malik Jones is a MU student running for the LBC royalty court. For the show, he played Arvarh Strickland, who in 1969 became the first African American faculty member at MU. “People can easily see what is happening nowadays, they don’t have easily the relevant information for the past. That’s what this play offers; and they were able to connect better because the scenes were portrayed by students they knew,” Jones said. This year, LBC wants Homecoming week to be a celebration of their identity.